You are here: Home / Blog / Abundance / The Island of Transformation is Calling You, Are You Ready? The Island of Transformation is Calling You, Are You Ready? Take a moment, focus your energy and move forward from your place of power. 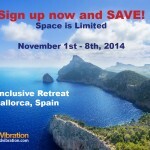 Mark your calendar and join Dian Daniel and Robin Patino for an all inclusive retreat to Mallorca, Spain. November 1st – 8th, 2014. We are headed to a beautiful Island in the Mediterranean and we want you there with us. This is a ONCE in a LIFETIME opportunity to experience one of the most sacred islands in the world. Known as The Island of Transformation. Using the energy of the Winter Solstice, the full moon and numerous historical high-frequency energetic sites, we have put together a trip that will transcend you physically, mentally and spiritually. Our intention is that this experience will bring you profound peace, clarity of who you truly are, and will set you up powerfully for the coming year and beyond. Everything at its finest is within reach. From the mountains to the sea, you will feel the magic all around you. The itinerary is filled with amazing events and opportunities to sooth you and elevate your vibration from the inside out. And the most important offering of all, is the opportunity to charge up your internal resources. Now, more than ever, the WORLD needs you at your most powerful Self. You won’t want to miss this, and we are excited to share this experience with YOU! http://raisedvibration.com/wp-content/uploads/2014/08/Social-Share-Image.jpg 895 1342 theRVteam http://raisedvibration.com/wp-content/uploads/2017/04/raised-vibration-logo-v2.png theRVteam2014-08-22 08:58:032014-08-22 09:03:45The Island of Transformation is Calling You, Are You Ready? Keeping Your Vibe High During Challenging Times Life is Full of Adventures. Let’s Share One!